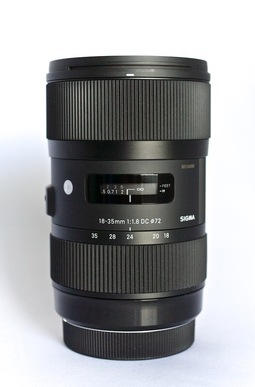 First the bad news: I had the Sigma 18-35mm f/1.8 DC HSM zoom lens for only one week before having to send it back. That's how popular it is with reviewers right now. Now, the good news: I understand why it's so popular. What an outstanding value ($799) for a versatile, innovative, and fast optic. I tested the Canon mount, but Sigma designs this optic for Nikon, Sony Alpha, Pentax, and Sigma APS-C DSLRs. And that's the second thing you should know: this lens is not for full framers. But if you shoot with a cropped sensor, then take a look at these feature highlights. Constant f/1.8 maximum aperture through the entire zooming range. Excellent image quality across the entire zooming range. Nine diaphragm blades that creates a rounded aperture opening. Close focusing capability to less than one foot. Quiet, swift ring-type ultrasonic motor for auto focusing. Well damped manual focusing ring. Internal zooming mechanism with non-rotating front (great for circular polarizers). USB dock compatible (accessory) for firmware updates and personalization. Beautiful design with robust construction. So what's missing? First, there's no optical image stabilization. So Canon and Nikon shooters are working without IS. Cameras that have sensor-based IS don't have this issue. 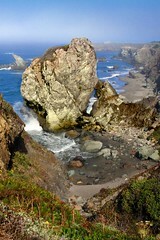 "The Big Rock" photographed by Derrick Story with the Sigma 18-35mm zoom with polarizer during the TDS Sonoma Coast Photography Workshop in Northern CA. Shutter speed 1/250, aperture f/7.1, focal length 19 mm, ISO speed 250, on a Canon 60D. Did I need image stabilization with the Sigma? Well, no, not the week that I had it. But I could imagine situations where I would appreciate having it. Keep in mind that on my Canon 60D, the equivalent focal length is 28.8 to 56mm. So IS could be useful at the longer end of the zoom. Also missing, at least to my knowledge, is weather sealing. This is less of a concern to me than image stabilization. 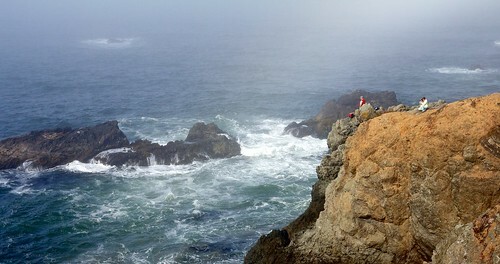 Based on my limited use of the zoom outdoors, I don't feel hesitant at all take it out in to the elements. It's also worth noting that this is not a light, compact lens. At 28.6 ounces and 4.8" long, the Sigma will require space in your camera bag. When on camera, however, I thought it was well-balanced on the Canon 60D, and comfortable to work with all day. So what's the bottom line? I like this lens and am considering putting it in my budget for DSLR equipment. It's very sharp, yet has the ability to soften backgrounds when needed. The quality of construction and design is outstanding. Even though it would be an excellent indoor, existing light optic, I would love to have it for shooting Fall color this year.